In the near future, enormous silver spaceships appear without warning over mankind's largest cities. They belong to the Overlords, an alien race far superior to humanity in technological development-and their purpose is to dominate the Earth. Their demands, however, are surprisingly beneficial-end war, poverty, and cruelty. Their presence, rather than signaling the end of humanity, ushers in a golden age-or so it seems. But it comes at a price. Without conflict, humanity ceases to work toward creative achievement, and culture stagnates. And as the years pass, it becomes more and more clear that the Overlords have a hidden agenda for the evolution of the human race-that may not be as beneficial as it seems. Originally published in 1953, Childhood's End is Clarke's first successful novel-and is considered a classic of science fiction literature. 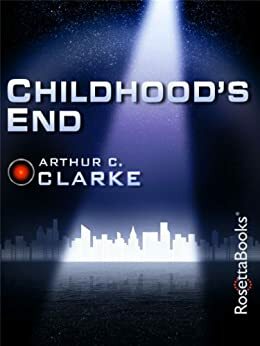 Its dominating theme of transcendent evolution appears in many of Clarke's later works, including the Space Odyssey series. In 2004, the book was nominated for the Retro Hugo Award for Best Novel. A great story brimming with deep insights reguarding the purpose of intelligent life.